I bought this car July 2014. Unfortunately, whilst driving it home a bolt got stuck between the water pump sprocket and the casing(which in turn pulled the tensioner off and the belt) . I originally planned on putting a new engine in, but then I was having problems with my daily which led me to buy a new car. 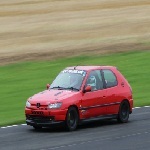 I also need to spend some money on the gti track car, I no longer have the money to spend on this Rallye. The car had covered 115k when I bought it, I only drove it home. I cannot check the exact mileage as the battery is dead. Conditioned gearbox at 88k. 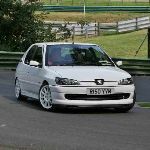 (On the way home I was amazed by the gearbox which led me to sift through the history to find out what had been done) On the way home the car was perfect it felt solid (until about 5 miles away when the problem happened). There is a dent on offside rear quarter... The car has minor dings in other places but as you can see from the picture it looks nice. The car is fine to be towed, or it can be taken away on a trailer. Yes mate, some one is interested. No deposit has been taken yet though. £500 and I'll collect with cash Saturday and a trailer.